If you do now or have ever run a website, you know how daunting it can be to maintain a web server. You need to become an expert on many topics like DNS, MX, CNAME, web languages, and so on. Many low traffic sites or beginner sites may be hosted on a managed and shared server to save time, money, and worry. This is a great solution but the fate of this solution depends on all of the clients hosted on the server. If one site uses too many resources or a bad piece of code, it can crash the server taking down every site with it which in some cases can be thousands of websites. Wouldn’t it be useful if you could see what other kind of sites were on the same server as you? You Get Signal has just the tool for this. It’s called a “Reverse IP Domain Check” and it takes a site URL or IP address and tells you all or many of the domains pointing to that server. This is a good way to check to see if your webhost or ISP is overselling or if there are very high traffic sites on the same server as you. By using this tool, you can see whether or not that $2 per month hosting plan based out of some guy’s basement in Russia is worth it or not. You will save yourself hours or potentially weeks or months of frustration from crashing sites and slow loading pages. 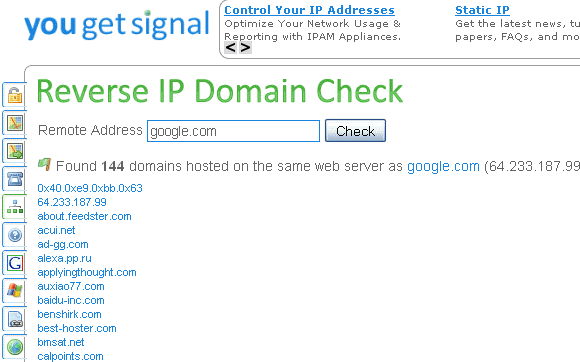 Although the “Reverse IP Domain Check” is an extremely useful tool for website owners, YouGetSignal.com also offers other utilities, some unique and some common. They offer the popular WHOIS Lookup Tool so you can check out who owns and manages a domain name, Phone Number Geolocator to find where a call originated, Port Forwarding Test to see if a port or ports are insecure on your computer, Visual Trace Route Tool to visualize the route of network traffic, and the nifty Network Location Tool to locate a physical network on a Google Map. YouGetSignal was originally created as a project from a Brigham Young University student but in my opinion is a very helpful collection of web tools in network and website management. What web services or applications do you use to manage your networks or websites? Let us know in the comments. Explore more about: Domain Name, Web Hosting, Web Server, Webmaster Tools. Great tool to check IP address for another websites. I've been around here for a while now, and I finally found something worth writing about: I found a great deal on custom Entertainment Centers . These guys have 24/7 call-in service and they installed AND delivered my custom Entertainment Centers all for Free!!! I just bought from them, and I've never had a more seamless internet buy -they ACTUALLY called me to confirm the order and talk about delivery timeâ€¦ unreal! Good tool and it is working fine. Nice to check system's ports as well. A very nice web-based application. Hum, waiter, a coffee for the one who found this little gem, please. Haha, when I search for my site a warning comes up saying sites with adult content are hosted on your server which could affect the PageRank of your site. Thanks for the tool, just checked my host, and maaaaan there are so many other websites hosted on the same server. It is very cool to be able to check that information. The thing to remember though is that many domains can be parked and added on to hosting accounts so in actuality there may not be as many actual "sites" running as it seems. In other words the number of domains is not equal to the amount of accounts/clients on the same server, it would be less.